Home > Stories > David Beckham has a few tattoos. Surely it shouldn’t hurt right? I was about 17 when I realised I wanted my first tattoo. I had no idea of the pain it would cause and the things I had to look out for. I didn’t even know anyone with a tattoo apart from my uncle who secretly had one and never really told my grandparents about it. I knew exactly what I wanted but was never really satisfied with the designs… there was something about them that wasn’t quite right. So I decided to leave it to fate for that right design to come along. 2016 soon came round 9 years after first considering having a tattoo and with myself going through phases every year of wanting a tattoo I finally came to an agreement with my parents. Now bearing in mind I am 26 years old and more than able to stand on my own two feet, I plucked up the courage to speak to my parents about getting a tattoo. At first I was slightly nervous as I knew my mum was going to be fully against it, my dad was also not fully on board with it either. I compromised with them knowing my dad was very artistic and creative so persuaded him to design my tattoo. Finally after a few weeks my dad came back with the design. To my amazement it was exactly the design I wanted during all these years asking friends and even paying some designers to create something for me, the perfect design was embedded in my dad. The hunt for the tattooist soon began. We got to August 2016 when I started my search but I had no idea where to start. I was googling all sorts of terms to find the perfect designer until one day I was on Snapchat and I saw a close friend of mine post an image of a tattoo she had just recently got with the hashtag #fithtattoo. I realised for someone to have got a tattoo five times from the same person they must have an awful lot of trust in them and from the designs that he had done on her they were pretty impressive. After finding out who he was where he was based I began to do my own bit of research. You will be asked if you have any allergies and any health problems you have that could possibly affect you in getting your tattoo. They are obliged to keep these on record for a period of two years before disposing of it. They should also use a sterile needle on every customer they are inking on. Most people think long and hard before getting a tattoo, personally for me it took me 9 years before I had the exact design and found the right tattoo artist for me. Getting “inked” is a very personal thing to have done and you need a hell of a lot of confidence and trust in the person you are choosing to permanently stain your body for life. You also hope that you will not need a personal injury solicitor after visiting a tattoo parlour. Unfortunately in some cases there are times where tattoos go wrong and it can either be the fault of your own or that tattoo artist messed up massively. complete disaster and it was enough to put anyone off from having a tattoo. The thing is this friend didn’t do their research. They were not given the care and support like I had been given by my tattoo artist. They were noticing a strange odour, swelling, sores and a discharge after they had their tattoo. After seeing a doctor about it they found that they had not been treating or looking after their tattoo very well. Not only was it done in a foreign country there was no health and safety certificate and no advice for aftercare too. 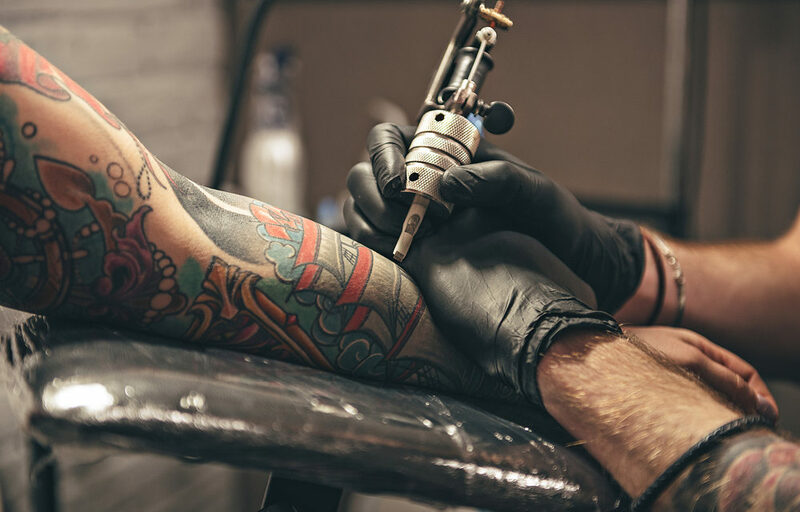 of the tattoo artist or tattoo parlour, the needle, as well as other things, can cause infection and result in that person needing a solicitor. There has been a 25% increase in tattoo removal over the years. As well as the environment in which the tattooing is taking place, sources of potential infection could stem from un-sterilised needles, old ink pots, the tattooist’s bare hands (gloves should always be used), and the clients own skin, which should be cleaned before the tattooist begins. in for a day session in getting my first tattoo and I absolutely love the finished product… my parents do too although my mum hasn’t fully admitted it yet . Don’t ever believe someone who tells you getting a tattoo on your upper arm does not hurt. If they’ve had just an outline then it’s perfectly understandable as to how it won’t hurt too much but will just be irritating. However, the minute they start the shading depending on your pain threshold and how much ink is going to cover areas where there is bone, it will be pretty painful. Your skin is being punctured 150 times a second with one needle however multiply that by 15 needles when they start to shade and add colour, your skin is being punctured 2250 times a single second. Still want a tattoo?